Be it for advertising, a website, or a print publication — Lieke will tell your story in compelling images. Let Lieke make honest, beautiful portraits for your website, magazine or ad campaign. Put your product in the spotlight! Lieke photographs products in studio or on location. Nobody wants to be generic. By having Lieke photograph your story in style, it will stand out in a sea of bland stock photographs. You will get the exact image that you need exactly when you need it. Tailormade, just for you. Lieke has almost a decade of hard-earned experience working as a photographer. She has learned to deliver even when working under less than ideal circumstances. And should something unexpected happen: she's always ready to adapt and come up with new ideas to make the shoot a success. Lieke likes to do business in a no-nonsense way. So before you make anything together, we get in touch and make an agreement: what you'll make together, what it'll cost, and when it's to be made. That way there'll never be any surprises — and everyone will be happier for it. It's important for your company to communicate consistently, especially in images of your campaign or on your website. Lieke can make photographs that are fully in line with your core message. And because Lieke can do your project start to finish, from concept through to the edits, everything will match perfectly. Lieke likes to understand what drives you or your company. This helps her process to find the right way to tell your story. That's why talking to you about your business, your goals, and your wishes are so important. Lieke always takes the time for the required preparations, research, and concept development to make your story shine. Lieke is based in the Netherlands, but she has worked extensively throughout Europe, Asia and Africa. She can work together with local art directors and stylists, or go on assignments by herself. Anywhere you want to have great images taken — Lieke is just a plane ticket away! Lieke Esveldt is a professional photographer from The Netherlands with over a decade of experience. Lieke works mostly for magazines, websites and advertising, creating photographic series of stories, people, and objects. 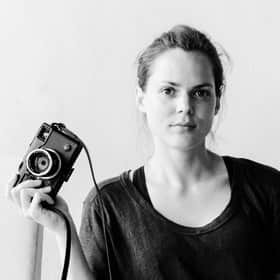 Besides her commercial work, she works as a documentary photographer all over the world. Lieke is currently based in Arnhem, The Netherlands (but always happy to get on a plane).